Creating cosmic sound frequencies out of junkyard waste is not a new thing on the streets of Kinshasa in the Democratic Republic of Congo. For years, bands have improvised, using car batteries as generators to amplify the sounds of hand-built instruments. 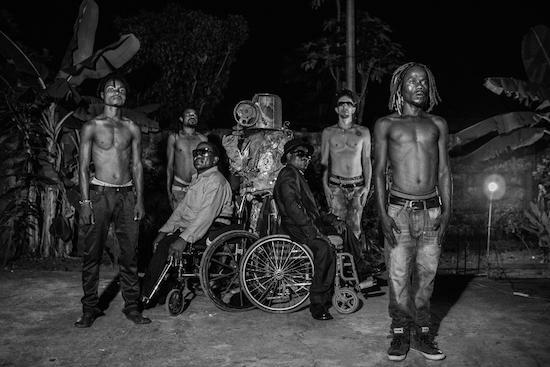 With new approaches, new and unexpected sounds often emerge, and Mbongwana Star's debut offering From Kinshasa is full of such innovation, a bold statement of their musical vision and one that shows the group looking to expand their horizons from Africa's third largest city to beyond. There is a sense of exploration from the beginning of opening track, 'From Kinshasa To The Moon', as spacey electronic sounds reach pitches that instantly connect with receptors in the back of your mind as beats collide with dub bass and piercing clean guitars join in. Celestial voices introduce the name of the group, Mbongwana, meaning 'change', like an incantation of praise to the source, spiritual and moving, yet also alien and out-there; mellow, with a glimmer of something more menacing at its edge. As the next track emerges over swirling keyboards, funky guitars and a busy beat, several different voices join in to share their message. Like the music, the vocals pile up into ever-evolving grooves and throughout the album, musicians collide over ideas amidst the creative flow. Echoing oscillations spin out in all directions and the harsh drilling sounds of power tools being fired up in the mix adds to the feeling of construction, a sense of the group making it up as they go along. Although Mbongwana Star is barely a year old, you may be familiar with a couple of the group's members from their involvement in Staff Benda Bilili. The story of the group was featured in the documentary Benda Bilili! ["look beyond appearances"], that followed the group of paraplegic (due to polio) street musicians for five years and captured the hearts and imaginations of music lovers the world over on its release in 2010. The film told of their rise from sleeping on cardboard in the shanty towns of the Congolese capital and getting around on gnarly custom-built tricycle wheelchairs and jamming on the streets and in the city zoo to touring the world. In the film children that came to watch the band philosophised that, like the birds in the zoo aviary, the musicians wished to travel outside of Africa and away from their poverty, which they did. When Coco Ngambali and Theo Nsituvuidi left the group they set their sights on creating a new style of music altogether. The pair, aged in their 50s and 60s, have been joined by a younger group of musicians - Randy Makana Kalambayi, Jean Claude Kamina Mulodi, aka R9, and Matuzolele Rodrick - for the new project. Mbongwana Star brings two generations together, fusing music from their youth, like Congolese rumba and Cuban soukous with Afrobeat, funk, reggae and dub, to contemporary influences like post-punk with electronic sounds. With the involvement of producer Doctor L, the broad palette of these influences blends the cohesive structure of the rhythms and melodies with an experimental playfulness, making the album an Afrofuturist banger, where the sound is just as powerful as the term suggests and quite unlike anything else. Can you introduce Mbongwana Star and how you came to be involved with them? Doctor L: I met the producers [Renaud Barret and Florent de La Tullaye] of the Benda Bilili! film, who had made other documentaries on the Congo, and this is how I got involved with Mbongwana at Kinshasa. Michel Winter: A lot of European producers are mostly going to West Africa and are scared of Kinshasa, which is not specifically dangerous, but it is just complicated for visas and all this stuff. And people have an idea of Kinshasa. So, when these two French film-makers started to work on the Staff Benda Bilili film, they asked me and [Belgian record label] Crammed Discs, who have also worked with Congolese music for many, many years, to take care of it. I had a career with Staff Benda Bilili for three years and then the band split for various reasons. Coco and Theo left the band and asked me to help them build a new project. It would have been easy for them to continue something similar to Staff Benda Bilili, because they were the main composers, but I didn't want to follow the same way, and have two similar bands touring. So I suggested, okay, let's do something, but something completely new, and why not something that does not yet exist? And we chose the three new young guys, a guitar player, the drummer and another singer, who were open for doing new stuff. There's some 2013 footage of a group called Staff Mbongwana International, which included members of this group and I guess there was some transition between the groups in the formation of this new band? DL: Exactly. Maybe there was not that much transformation before they met me, and now it's been transformed and transformed together. This is why I play in the band too. In the Staff Benda Bilili film the group got together in the zoo and jammed, or in the street. Where does the new group get together? DL: Most of the time we rehearse in the outdoors, kind of in the street all the time. Because there's no electricity generally and you need electrical inputs. MW: There is no electricity almost everywhere, and when there is, it is for short times, and it is not every day, it is not all day. Where we recorded Mbongwana the first time we had not even five minutes of electricity in ten days, so of course it is not the best conditions. But in the meantime it is giving ideas, how they are sorting out the problems. Somehow it is funny, or it is interesting; the group have to adapt to these conditions, or sometimes try another style, or other songs. DL: So, I mean, it's not related really to equipment, we can do lots of stuff with nothing. The principle is more like, we took everything really from scratch and what it is is really what it is. And we are working on the next album, so we are already composing the new songs. Are you able to explain a bit about the production. I have read you talk about having everything in the red and having three TV sets blaring in the background. Can you explain what was going on to create this wall of sound? DL: Well, there is no silence in Kinshasa. People listen to everything saturated. TVs have got no compressors. It gave the recording an energy. It is like tearing something apart, like [makes tearing noise]. It's funny you know, that sometimes a WAV track sounds much better saturated. With the group including two generations of musicians, is there a sense of trying to mix the traditions of the past, while moving it forward? Is that the kind of feeling you were going for? DL: Yeah, well, you know, in the 1970s and 80s there was a lot of psychedelic rock bands in Ghana and Nigeria. I think it's just in the last 20 to 30 years most of the music coming from Africa was really stereotyped, you know, like if you are from Africa, you are doing African music. But I think the idea behind this thing is more personal. Like, if you say you are doing 'English music', what does that mean? So, the aim is to get something personal and work with the qualities of the different members, who have got their own culture. That is what works, because you have got a contrast between things and you hear them better in a certain way. You have to understand in this band there are different people. Coco and Theo are older, they are old school. And the younger guys understand much faster than them, they just understand automatically, so it depends who you are speaking of. MW: The younger members of the group have knowledge of local Congolese rumba and they were also interested in rock, hip-hop and they have easier access to the internet and listen to other things, more close to other young people, doing things completely different, even if we have no idea here what is really happening in Kinshasa. It is really a huge, huge mégalopole, a huge city, of nine million people. There are a lot of styles, like any big city in the world, like New York, London or Paris. I think at the beginning Coco and Theo were the founders of the project, and have found themselves to be the youngest two kids at the end. When Doctor L arrived, it became something much more modern and close to the influences of the younger members. And now they [Ngambali and Nsituvuidi] are following what is happening, they are of course coming with their background, but it is not more powerful than what the youngest are bringing in. The guitar player is much more noisy than the singer, so somehow this kind of wisdom is more powerful. So it starts like this, the youngest took the advantage musically, but the oldest are still the singers and at the end the instruments have to follow the singers, so it is kind of a nice conflict lately. I think, for me, it is something completely new. What is the style? I don't know. It is a new style, for here and for there. What is the group's reaction to what they have created in the studio? DL: It's become theirs very quickly. That's the material we are working with. They like the punk thing a lot, because on the stage we are much more rock & roll than on the record. They get really excited and when we are excited it's funny. DL: But that was not the title. The title was From Kinshasa To The Moon, also the first track on the record. It gives you the culture point. Because all the material on the record is from Kinshasa, the astronaut [from the 'Malukayi' video] is a guy who does performance in the street and everything is from there. All these visuals are all from there, there is nothing from Europe, it is all local. That was the idea, to give another perspective on the idea of what is going on in Africa and where we are working with it. Because I want to mix it up on this project, with other contemporary artists, who do happenings, installations… Music is cool, but it is good to mix it with the arts and different ideas. You have described the process of making music as being like recycling, creating what you can out of what is available. DL: I'd like to make the project more direct, because there's a lot of people who make instruments really, who invent lots of things with nothing. That's the environment. With this band, we are influenced by that, but we're not using that much. We tried to get one or two guys who had all of these percussion instruments, handmade with dustpans and stuff. But it's not that easy sometimes just to add, however it is done, whatever it is. So for the moment, we know that environment, we have had cats come in and play with us, but we haven't used it that much. The place is poor and there are very few instruments available. But for the band we have bought guitars. And Kinshasa is an expensive place to live. It's not like other West African places, where it is $200 for an apartment a month; no, there it is more like $2,000. I don't know how people make it, to tell you the truth, because people earn around $50 a month. It's a big contradiction. What do you want to get across with the way the live set is going and how this music is brought out? DL: Oh, we're just going to make the biggest African band that has ever been! But you know, you need bridges. You need to be able to communicate, everybody needs to communicate. So this is a bridge as well. For there and for the rest of the world as well. The group do strange stuff, they do original stuff as well, like any European band. The main idea is to find new doors, new artistic ways that correspond more to people than to a nationalist thing; [more] about a country, about a town. Everybody has got their influences and that's what music is.